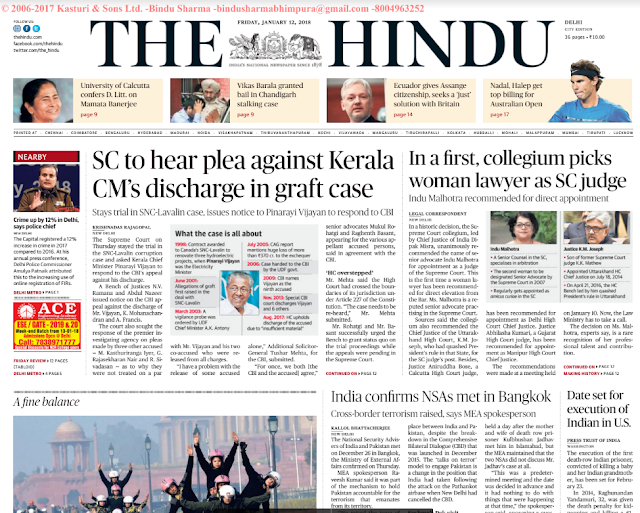 The Hindu Newspaper 12th Jan 2018 PDF Download - Get here today the Hindu news epaper Free PDF , news headlines, highlights. - In recent times, runways at Indian airports have been invaded by a variety of mammals — ranging from hyenas and jackals at the international airport in New Delhi, to spotted deer and wild boars in Nagpur, and the common stray dog in Chennai. - In a historic decision, the Supreme Court collegium, led by Chief Justice of India Dipak Misra, unanimously recommended the name of senior advocate Indu Malhotra for appointment as a judge of the Supreme Court. This is the first time a woman lawyer has been recommended for direct elevation from the Bar. Ms. Malhotra is a reputed senior advocate practising in the Supreme Court. - The National Security Advisers of India and Pakistan met on December 26 in Bangkok, the Ministry of External Affairs confirmed on Thursday. Date set for execution of Indian in U.S.
- The execution of the first death-row Indian prisoner, convicted of killing a baby and her Indian grandmother, has been set for February 23. - The Capital registered a 12% increase in crime in 2017 compared to 2016. At his annual press conference, Delhi Police Commissioner Amulya Patnaik attributed this to the increasing use of online registration of FIRs. All The best for competitive examination Preparation.